The (sort of) much anticipated The Great Gatsby came out last Friday. This is Baz Luhrmann’s first feature-length film since Australia (2008), so I wasn’t quite sure what to expect. Luhrmann’s last three big films — Australia, Moulin Rouge!, and Romeo + Juliet — were all aesthetically pleasing and had some lovely music, so I went on to expect nothing less from The Great Gatsby. Tobey Macguire prepares us in the trailer for what to expect. “…the buildings were higher, the parties were bigger, the morals were looser and the liquor was cheaper…” So let’s mix together one of the cheapest and most classic prohibition-era cocktails and toast to a traditional highball. Want some Jim Beam and Ginger, ol’ sport? Pour 2 oz. of your favorite bourbon into a highball glass filled with ice. 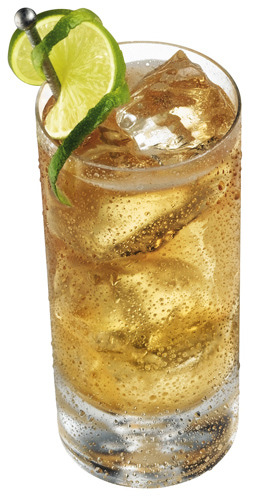 Fill to rim with a ginger ale or ginger beer such as Fever-Tree and garnish with a twist of lime. From Our 10 Favorite Prohibition Cocktails. Enjoy! Plot: Midwestern war veteran Nick Carraway (Macguire) moves to Long Island to make something of himself in finance on Wall Street. He buys a small abandoned cottage in the shadow of Mr. Jay Gatsby’s (Leonardo DiCaprio) mansion. Nick slowly learns some of Gatsby’s ulterior motives in befriending him as well some secrets from Gatbsy’s mysterious past. In the meantime, Nick’s cousin Daisy (Carey Mulligan) begins to question her marriage to Tom (Joel Edgerton). The first trailer did a great job getting me excited for this movie. It also made it look like a movie that really should have come out during Christmas time, although I now see why it might have fared better as a summer blockbuster, of sorts. What the trailer succeeds in is its music, although I’ve heard some debate about this. Jack White’s cover of “Love is Blindness” by U2 is a very powerful song that makes perfect background music for the many emotional breakdowns the characters experience. A lot of the criticism that The Great Gatsby has gotten is along the lines of distaste for the music included. Even the trailers show some of the asynchronous rap-esque music that so many people have been complaining about. Now, keep in mind, the film is executive-produced by Shawn “Jay-Z” Carter, so that sort of music makes sense. Think of it as more of a modern take on 1920’s jazz. If that bugs you, remember that Moulin Rouge! was entirely asynchronous music, ranging from David Bowie to Christina Aguilera. It’s kind of Luhrmann’s style. If that’s still not your style, try out the highball while watching the movie. For this highball, I used original Jim Beam Kentucky Straight Bourbon Whiskey. It’s hard to find ginger beer where I live, so I opted for the cheaper (and possibly more available in the ’20s?) ginger ale. Quick reference: ginger beer is brewed from fermented ginger, whereas ginger ale is just carbonated water with ginger flavoring. With that in mind, my poor-man’s highball tasted a bit more like watered down bourbon that I would’ve liked. That said, the twist of lime is a nice addition, and the 2 oz. renders the bourbon strong enough to leave a sharp kick behind. I’d still highly recommend buying ginger beer though, if you can find it. Gosling’s ginger beer is a good (and possibly more common) brand to try as well. The highball became a popular prohibition-era drink because American liquors were on lock down and Scotch whisky was available just off shore. The highball originally got its start as a Scottish drink, and took off in the U.S. because of how simple it was to make. Three ingredients — liquor, soda, ice. It’s also incredibly versatile. While the original concoction consists of scotch and soda, these can now be interchanged for many ingredients. Vodka, gin, tequila, and rum also make common liquors in place of scotch, whiskey, and bourbon. Beyond club soda and ginger ale/beer, any variety of juices or colas can be used as the filling ingredient for the highball. Just remember that not all combinations go together. 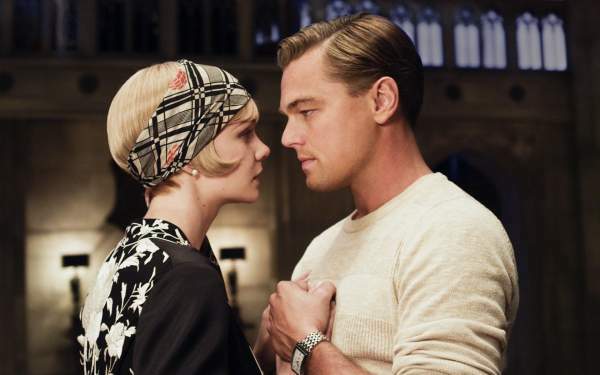 In talking about this movie, a fellow Rooster Illusion writer said, “The Great Gatsby was basically a three hour Chanel perfume commercial.” I don’t at all disagree with that. The costumes are, of course, beautiful to look at, but they almost look like what the current generation of teenagers and 20-somethings would wear if playing 1920s dress-up. Something about the costumes seemed fake. But hey, if the music is a modern twist on 20s jazz, why can’t the costumes be a twist on their 20s counterparts? The costumes weren’t all that felt unnatural, though. I’d totally expect to see hipsters wearing this today. DiCaprio gave a slightly less than admirable performance as Jay Gatsby. Ending every other sentence with “old sport” is much more acceptable in a book than in a movie — it just sounded awkward in person. Perhaps another actor could have done it better, but as we saw in The Aviator (2004), DiCaprio is great at playing a self-built man in the early 20th century. I feel like this is a trouble that anyone runs into when trying to film a period piece, that is, trying to make the dialogue sound natural. Carey Mulligan fit right in though, and gave an amazing performance as Daisy. Although I haven’t read the book since 9th grade, I still remember quite a bit of the symbolism, which Luhrmann does not hesitate to include at all. The green light at the end of the dock and the oculist’s eyes on the billboard are both very prominent throughout the movie. If there’s anything you’d like to take away from this review, let it be that The Great Gatsby is aesthetically pleasing and very true to its source material (and dull at times because of it). Or you could take away the history of highballs. Your choice. So close, and yet, so far.